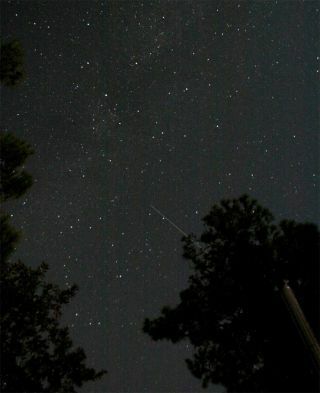 Amateur astronomer Tavi Greiner took this photo of China's Tiangong 1 spacecraft from Shallotte, N.C. on Oct. 4, 2011. A robotic Chinese space capsule is poised to make its docking debut a space laboratory Wednesday (Nov. 2), and amateur astronomers are keeping watch. China's just-launched Shenzhou 8 spacecraft, which launched late Monday (Eastern Time), is expected to dock at the country's Tiangong 1 space module to form a miniature space station. A few amateur astronomers have already spotted the orbiting Tiangong 1 spacecraft in advance of its space date. On Oct. 28, observer Kevin Fetter of Brockville, Ontario set out to catch Italy's SkyMed 2 satellite fly over in the night sky. What he got was more than he bargained for. Not only was SkyMed 2 clearly visible in the footage he shot with a low-light security camera on a telescope mount, but Tiangong 1 also passed across his field of view. Fetter snapped a video of the Chinese space station test module, which was the brighter of the two objects, as it soared overhead. "It was the first time I was able to observe a pass of Tiangong 1, because of the weather," Fetter told SPACE.com in an email. "It was also nice to see another bright [satellite] in orbit." Other backyard observers also had luck. Viewing from Shallotte, North Carolina, Tavi Greiner caught a photo of Tiangong 1 streaking across the sky on Oct. 4, shortly after Tiangong 1's Sept. 29 launch. "The image was taken on the anniversary of Sputnik 1's 1957 launch, which offered a wonderful opportunity to discuss a little world space history with my children as we watched the Tiangong 1 flyover together," Greiner told SPACE.com. As Tiangong 1 flew between the stars Cygnus and Cassiopeia shortly after sunset, Greiner said it was surprisingly bright and easily visible to the naked eye. This photo of China's Tiangong 1 spacecraft was taken by amateur observer Justin Cowart in Carbondale, Ill.
Justin Cowart of Carbondale, Ill., also observed the docking test module without a telescope, using a Nikon D80 camera to see the spacecraft zoom across the night sky. The sight was short-lived, though. "Lost it pretty quickly as it was moving into shadow, since it was in fairly close proximity to the first quarter moon," Cowart wrote on the site SpaceWeather.com. China's first docking test is an important step toward the nation's goal of building a larger manned space station by the year 2020. China is only the third country, after Russia and the United States, to launch a person to space.